It is still rough going, but we are still hanging in there. Maus has not progressed as I’d hoped. Jake has presented some issues with eating. Both are at the Vet’s office this morning. For Maus, we knew that finding a routine in her new reality was going to be challenging. Being a CKD cat requires close attention to diet and fluids. The fluids are not too much of a problem; she has resigned herself to getting stuck with a needle every day. Of course, she does not like it, but she also does not struggle with it. Her diet, however, is a different issue. By the time she came home from her crisis, she was eating the NF diet food, mixed with just a little Fancy Feast. To take better control of the financial burden having to buy three different cat foods, I decided to try a cheaper alternative to the Purina NF, the HI-TOR Veterinary Select. It was noticeably lighter, different in texture and not as firm. I thought that with mixing as I did with the NF, she would eat it. It did work for about two weeks. Then about a week into January, she started to back off of food altogether. I resorted to just feeding the Fancy Feast, and as she is eating it, she is not eating as much as she needs to gain weight, which in her case is critical. Her Vet will do some test today to see if her levels have normalized as we hoped and we will probably work on anemia and some nutritional supplements. Jake has a history of not eating well. Most of it centered on his dental issues. As his gums receded and exposed the nerves, he would stop eating due to the pain and even after the offending tooth would come out; it was always a chore to get him to eat again. When we had the last of his teeth pulled in late 2011, there was a complication with the procedure which resulted in a fracture of a part of his jaw. The break did heal, but he did have some residual pain and clicking that discouraged his eating. I was compelled to force feed him for about a week to get him to use his jaw, work passed the pain and clicking and learn to eat again. He was doing okay with it for a while, but still had moments where it did bother him sometimes. I had also discovered that I might have under-fed him, not so much with the amount of food, but rather some calories he was taking in. I tripled his intake, but he drifted off of eating altogether, and I had to start force feeding him again. He had seemed inconsolable also for a couple of weeks, so he too is at the Vet for tests. Moshe Moshi, for now, is just fine; although I’m fearful his raw food may have changed something in the formula since he hasn’t been eating as much of it lately. I will be looking around the apartment to make sure they are all not exposed to something that could be affecting their appetite, cleaning small areas, sanitizing litter boxes and removing any and everything that has been cluttering up my space. 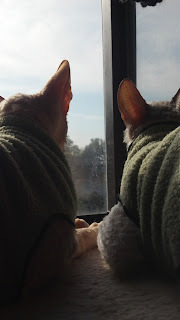 It would be great if I could contribute their eating issues with a failure of some system in the apartment or me; people drugs, bad water, spoiled food, or foreign objects. It’s tangible and something I could change. But, if I get the “we don’t know why” answer out of this it’s going to make it hard to combat. Either way, I think we are in for a long fight. Wellness struggles can be so heart-wrenching and wearing. Wishing the best for you, Jake & Maus. And purrs to Moshe Moshi for doing so well! We have just gone through diet changes with our boys. Always frustrating when they'll pick up a change they like in only a day or two, but refuse the changes they need to the point of insanity. Here's hoping the naked kids come through as well as our furry ones did!